Soft light descends upon a vibrant room as darknes takes its hold outside. A lovely, blonde pianist settles onto her stool and fingers the opening chords of the timeless “Someone To Watch Over Me” as, a few feet away, a convivial quartet of co-workers begins a discussion of what’s for dinner. Intermittently, friends and strangers—mostly friends—file in to Morehead City’s Bistro-By-The-Sea for the kind of fare that, a few years ago, would have required a passport had a dynamic young couple not decided to open the area’s premier fine dining establishment. But it’s not just the food that keeps the dining room full night after night and year after year. The patrons have turned the restaurant’s entrance into a revolving door as much for the impeccable service as for what’s on the ever-evolving menu. 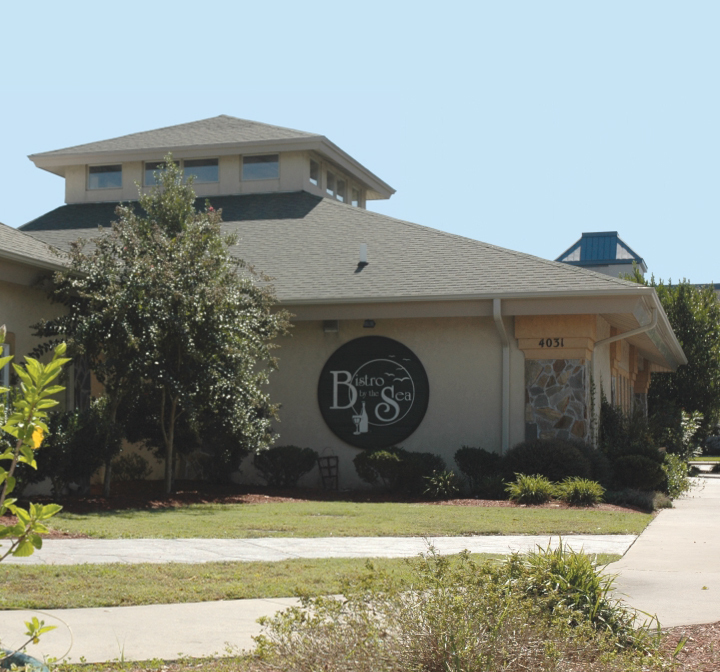 And it doesn’t hurt that The Bistro, as it’s known to regulars, has become the Crystal Coast’s place to be and to be seen. Walk through the front door of the stylish building between Arendell Street and Bogue Sound on any given night, and it’s likely you’ll see a sizeable collection of the same people you saw the last time you were there. On this night, the open bar area is crowded with many of the area’s movers and shakers — quite literally. Four close friends who work together for a local real estate company enjoy cocktails at The Bistro’s piano bar as a bartender rattles a martini in a stainless steel container. “I’ve eaten all over the world, and this is one of the best,” says the well-traveled Tricia Smith, one of the foursome winding down at the piano bar after a day at the office. “We are so fortunate in Carteret County to have such an upscale, top-shelf restaurant.” Smith and her friends help make up the core clientele that co-owner Libby Eaton says is the heart and soul of The Bistro’s customer base. The women, who are enjoying a semi-weekly girls’ night out, are all among those who keep coming back to sip on Grey Goose martinis, eat a relaxing dinner and soak in the elegant ambiance offered by an attentive staff. None of them, though, would be here if not for a chance encounter between two teenagers in Florida years ago. The story of The Bistro, like the story of any successful business, is one of sacrifice, tenacity and a little serendipity. As much as anything, though, the story of The Bistro is a love story. Eaton owns the restaurant with her husband, chef Tim Coyne. To say the two complement each other is like saying lightbulbs complement lamps, or engines complement cars. One doesn’t work without the other. Coyne is quiet and dry; Eaton is vocal and outgoing, even charismatic. He’s pensive and speaks in carefully measured sentences; she tends to operate with less of a filter. He works unseen, to use restaurant vernacular, in the back of the house; she runs the front in the public eye. “They’re very much opposites,” says Buddy Murdoch, a longtime waiter at the restaurant. “She’s Ms. Social Butterfly and he’s Mr. Wallflower.” In short, he prepares the food at The Bistro; she sells it. There is, of course, way more to it than that. Coyne and Eaton, both 42, spend ungodly hours keeping their business thriving. On top of employing and managing a staff of about 20, together they handle everything from ordering food and supplies to maintaining the building to keeping the customers happy. Without them, The Bistro’s world doesn’t spin. Thanks to their all-consuming jobs, there’s a lot they don’t do anymore. But they both knew it was all part of the deal when The Bistro was born in a gay bar on the beach. After a courtship that lasted through Eaton’s college years at Ball State and Coyne’s culinary arts education at Schoolcraft College in Livonia, Mich., the couple eventually worked together at a private gourmet club in Coyne’s native Detroit. There, Eaton, who grew up in an alcohol-free Methodist household in Indiana, began her oenophilic tutelage. The owner of the club had a 1,000-bottle wine cellar and encouraged Eaton and Coyne to explore Europe to find new bottles, a practice that has carried over into their current business. The time at the club served them well. “By the time I left there,” Eaton says, “I knew all about wine.” Eaton’s brother lived in Charleston, S.C., and on her visits there she fell in love with the city’s Southern charm and warm climate. Tired of the brutal Michigan winters, the couple decided to move south. Coyne took a job as chef at an Atlantic Beach hotel until they decided to open their own place. The restaurant quickly benefited from retirees on the island who liked the food and the service and told their friends. Soon The Bistro would outgrow its tiny environment, and Eaton and Coyne began to scout locations to erect a new, more spacious building. They settled on the current location, which was then a vacant lot in front of the Hampton Inn, where they began to build their dream restaurant. The couple had a hand in every detail, from the white columns to the soft lighting to the sense of openness one gets upon entering the dining room. Eaton wanted to be able to monitor the entire room from one spot. Eaton employed Greenville artist Carolyn Kaler to paint lively murals on the walls and in the atrium that sits above the piano. Kaler brought an RV and spent a week in the restaurant’s parking lot while she worked on the project, which included extensive scaffolding. The end result is one of The Bistro’s most striking physical features. The colorful grape vines, stones and ancient ruins rendered in the atrium add to the restaurant’s worldly feel and one-of-a-kindness. 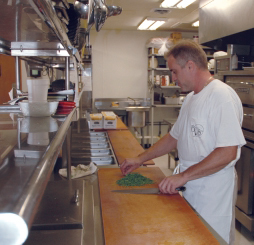 With everything in place in the new building, the current version of The Bistro opened in May of 1997, exactly four years after its humble beginnings. Since then, it has become known for the consistency of its food and service and its status as a social hub. And it’s not just the customers who keep coming back. Murdoch, who shares the title of head server with co-worker Jody Cartwright, is a holdover from the old restaurant. Murdoch celebrated his 10-year anniversary at The Bistro in July, and Cartwright, who started there in January of ’99, isn’t far behind. Neither has plans to go anywhere. It works both ways, Eaton says. Customers regularly request to be served by their favorite staff member, who often already knows what longtime customers will order. “Year after year, day after day,” Eaton says. “It’s like they have a following.” Count the women at the piano bar among the devotees. Smith and colleagues Ruth Barnes, Cheryl Raper and Jane Cameron sip cocktails and enjoy the music as they discuss their travels and laugh at stories of Smith’s propensity for clumsiness. All regulars at The Bistro since it opened, the women work for the company that sold the restaurant its current property. Eaton scurries around the dining room, greeting customers with hugs and generally keeping everyone happy. Coyne, meanwhile, works his magic in the kitchen. The most requested dish is the baked grouper and sea scallops, which was selected this year by Goodness Grows in North Carolina as the state’s second-best dish, finishing just ahead of Raleigh’s Angus Barn. The creation of some of the area’s finest food is not without its perils. There are tense moments when the building is full and there’s a wait to be seated and somebody, for whatever reason, sends a dish back to the kitchen. Coyne’s back of the house and Eaton’s front inevitably collide when there’s blame to be placed. It’s the nature of the restaurant business, especially when a husband and wife head up those sometimes opposing teams. But Coyne and Eaton say that after nearly 25 years of marriage, they’ve learned to leave it at the office and not bring it to the 10 acres on which they live in Newport. Theirs is an unusual relationship, one that requires more patience and a shorter memory than most. Five days a week, they arrive at the restaurant between 10:30 and 11 a.m. to do paperwork and prep work for that night. They head back home around 2:30 and return at about 4 to begin their evening, which usually ends after 1 a.m. Most of the long hours are spent apart as they do their respective duties, Eaton points out, so it’s not as though they’re together all the time. They’ve had employees work for them for as long as a year without knowing the two are married to each other. Given their contrasting styles, it’s an easy mistake to make. Eaton describes her husband, the chef who makes everything from scratch, as “a dying breed.” Asked if it’s true, Coyne’s bone-dry sense of humor comes out: “Getting old, yeah,” he says plainly. “I’m gonna die. That’s what I tell her.” But Coyne is one of the few chefs left in the country who make everything the old-fashioned way. Having grown up in an Italian family in the restaurant business and worked in professional kitchens since he was 15, Coyne takes no shortcuts. The Bistro’s bread is made fresh daily; the vegetables are cut fresh daily; the local seafood is filleted and consumed the same day it’s caught; all the soups are made from scratch. It’s a practice that is at least as time-consuming as it is time-honored, but Coyne says it’s worth the extra trouble. “It’s always worth it,” he says in a matter-of-course tone. “It’s the restaurant breed, I guess. You’ve just got to have it in your genes. There’s a lot of people that don’t have it, and they just do it for a job. To us, it’s really not a job. We’re not motivated by money or anything like that at all. It’s just trying to produce a good product and trying to give the public something different or unique.” Coyne doesn’t use recipes; he draws upon a lifetime of experience, mixing and matching ingredients to create just the right combination. Coming up with a new dish, he says, is his greatest professional joy. And if the restaurant is open, the chef is there. Cartwright recalls a weekend when Coyne seemed particularly ill and still showed up for work. For obvious reasons, he kept his distance and only supervised. Every January, Coyne and Eaton close the doors of the restaurant and give the staff about five weeks off. All involved use the time to travel and unwind, but the time off has a dual purpose. The owners take a trip every year to add to their menu. Each winter Coyne and Eaton go in search of new wines and new dishes, hoping to bring a little of the flavor of a different part of the world to Morehead City. Their travels have taken them all over Europe and the U.S., and it shows on the menu. One winter’s trip took them to San Antonio, where they found a prickly pear martini. (“It was so good,” says Eaton, “but try to find prickly pear juice around here.”) The wine list includes a ’96 Temparnillo the couple discovered at a vineyard in Spain. Other regional influences are evident throughout the building, none perhaps more so than the lounging bed on the back patio, an infusion of Miami nightlife. Adds Coyne: “That’s what motivates me, I think: being on the cutting edge — staying up to date on new products, new developments, new menus, recipes. It always changes.” The effect, Murdoch believes, has worked. “I think when you walk in the Bistro,” he says, “you kind of walk out of Morehead — just the atmosphere, the entertainment on the weekends, the decor of it. The employees scatter all over the world, too. Murdoch always goes on a cruise and Cartwright, a real estate broker in Cedar Point by day, usually ventures off somewhere. Even when the restaurant is open, Coyne and Eaton spend what little time off they have focused on making it better. Besides catering events on Sundays and Mondays, when it’s closed, Eaton keeps a grueling schedule. A champion of the local seafood industry, Eaton serves on several boardsand committees and teaches a course for Carteret Community College on dining room management supervision. She spends the rest of her time keeping in shape for a job she likens to a professional sport. It was a balmy summer evening in early-’80s Daytona Beach, and young Tim Coyne was hurting. Dog tired and lobster red after a long day in the sun, the 17-year-old made his way through the lobby of the hotel where his family was staying, looking rather ratty in shorts and a tank top but still up for a night on the town. Hanging out by a wall of video games — one can imagine the ubiquitous Pac-Man, Donkey Kong and pinball machines of the era — an attractive young girl saw the boy she had noticed earlier that day by the hotel pool and followed him out the door. She made the first move. At least, that’s how he remembers it. “You chased me, right?” Coyne beckons to Eaton, standing just out of earshot of his recounting of their first encounter. “Yeah, whatever,” his wife replies, throwing her head back with a laugh that has become a sound as familiar in The Bistro as a shaking martini. The important thing is not how they got together; the important thing, after all, is that they did. And through decades of hard work and sacrifice and long days and late nights, they’ve persevered and grown, just like their restaurant. With that, an infectious laugh fills the room and the owners begin to get The Bistro ready for another night.